Microsoft has been refining Windows 8.x with updates coming in different sizes and features. But it seems that these updates introduced most of the traditional features incorporated in the newly introduced Modern UI. Though the chrome less UI has it's own advantages for tablets, the desktop is still the home for millions of Windows users. Let's leave this debate and enter into the next version of Windows which seems to be shaping up nicely ! This is Windows 10 !! I'm not kidding and you may have a look at the screen shot and say that it is Windows 8.1 Pro but that's how Microsoft has disguised the next version of Windows. As you can see this just a screenshot from the internal preview version of Windows 9 which is currently circulating in the desktops and tablets inside the Redmond giant. Well the most wanted feature in Windows 8.x makes it's way to Windows 9, yup I'm talking about the Start menu. It has a new look and is similar to what Microsoft showed in the Build conference earlier this year. You can pin tiles and move them around and arrange them the way you want. And also according to my sources, users will be given the option to choose between the Start Screen and Start menu which is a welcome change as some users like me have got used to the Start screen and may not always want the Start menu. It's definitely a efficient way to open apps and see the live updates as they happen, right in your desktop. Still there is a lot happening behind the screens that this screenshot pretty much hides, IE pinned in the taskbar may be the next version of the browser built in Windows, IE 12 and of course most of the traditional apps are still in Windows 9 such as Windows Media Player,Word Pad and Calculator. There is also a good chance that the apps might open in the desktop in devices where start menu is used.There is a lot to change in the coming months as Microsoft will roll out many visual changes to Windows 10. When it hits the market as a public preview, it would be a completely different OS than it is shown in the above screenshot. Because Microsoft does not touch the UI part till it gets all the background works done. It happened with Windows 8 as it looked very similar to Windows 7 till the public preview which brought in some radical changes such as the removal of aero . 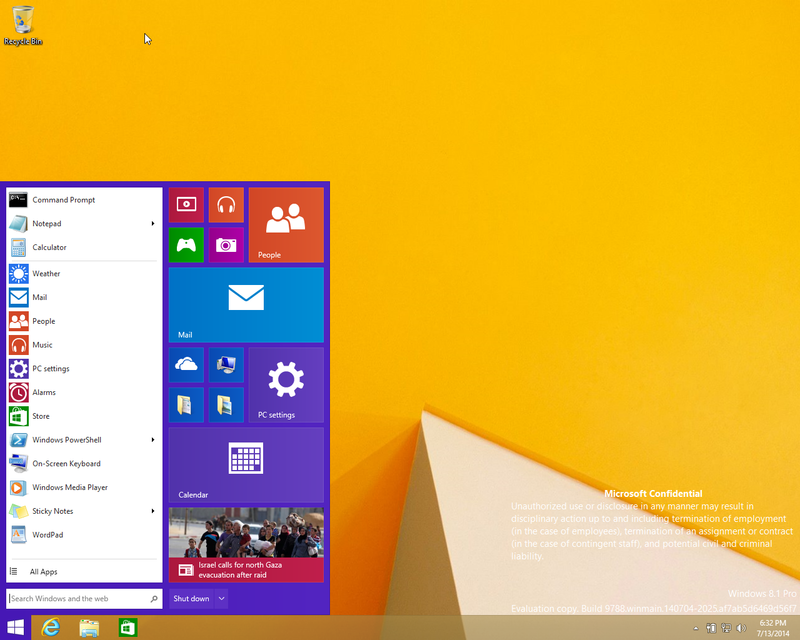 This Screenshot was leaked intentionally to let people know that start menu is a key feature coming in Windows 10. Still Cortana has not made her way into Windows 10 ! My sources also say that a Windows 10 build 9788 is going to leak very soon which is the same build from which this screenshot is coming ! But for now we have nothing to do but to wait and wait ! What do you think about Windows 10 ? Do you like the new start menu ? If the modern apps open in the desktop in Windows 9, then I suppose more people would deploy the OS in their PCs as they will get an environment very familiar of legacy apps to which most of them are used to.